Wooden walls integrate bookshelves, doorways, windows and a foldaway desk inside this family house in Geneva that has been renovated by local architect Aurélie Monet Kasisi (+ slideshow). The clients required extra storage space for an extensive CD collection, but also wanted to divide two large rooms on the ground floor into four smaller spaces. 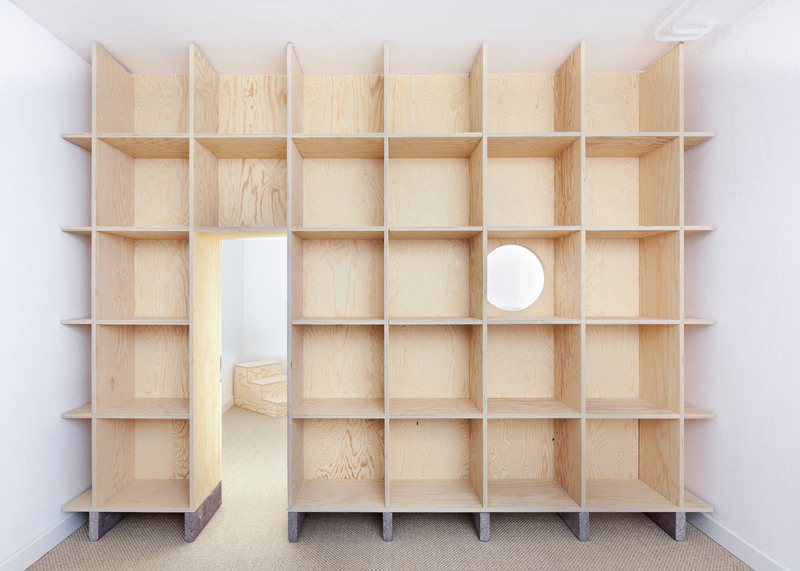 In response to this, Kasisi designed a series of bookcase-like structures that simultaneously work as storage and partitions for the space, dividing it into a home cinema, a playroom, a small office and a bedroom for the au pair. 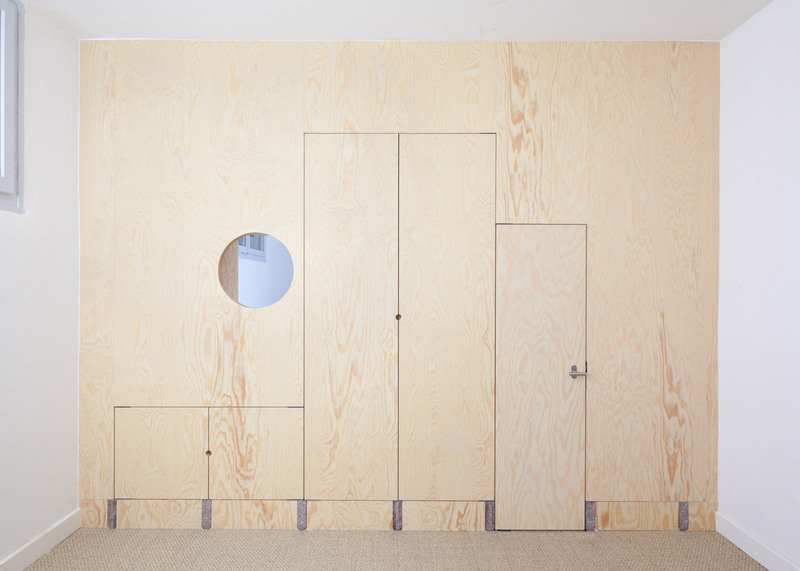 Each of the partitions is made of oiled pine plywood. These are anchored by masonry blocks produced from recycled bricks and old landscape edging elements, which add red, pink and grey tones to the plywood surfaces. "On one side, the feet serve as a solid base for the bookshelves and on the other side, they emerge within the wood panel – giving to the walls a precious touch with jewellery-like incrustations," said Kasisi. The first bookshelf separates the home cinema from the playroom. 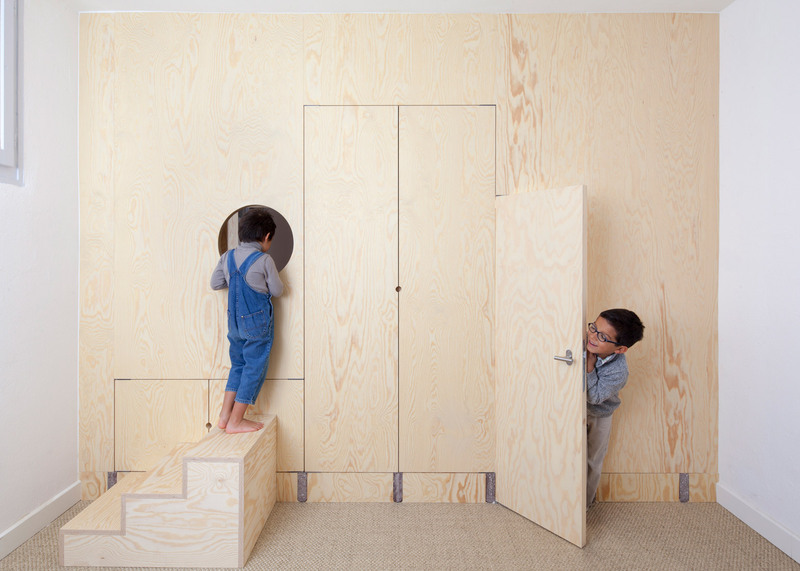 A tiny door provides the children access to their play area, while a circular opening in the bookshelf creates views between the two spaces. "The circular opening in the bookshelf allows the parents to keep an eye on the kids if necessary… or playfully," added the architect. The second room was transformed into the bedroom for the au pair and the office. The office side of the wooden partition features large shelves for books and files. 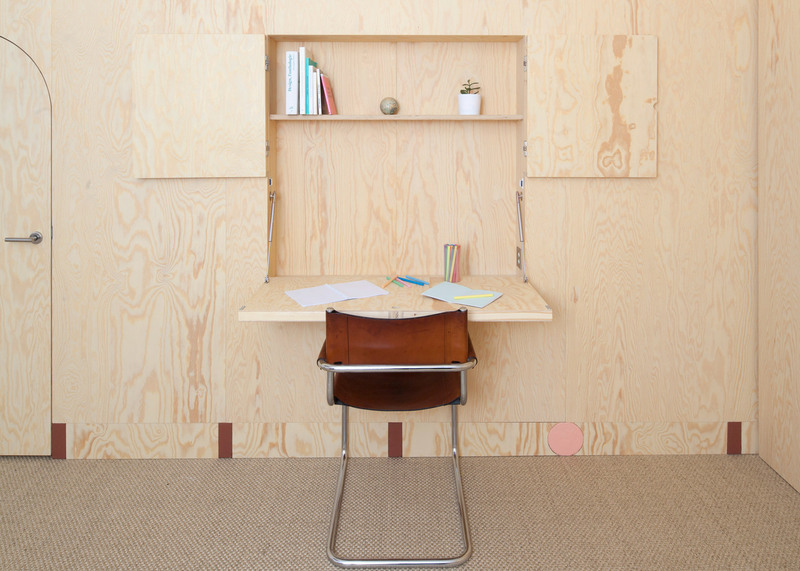 In the au pair's bedroom, the partition is complete with a foldaway desk. A built-in closet with pine doors and a pastel interior finishing was also added to the bedroom. 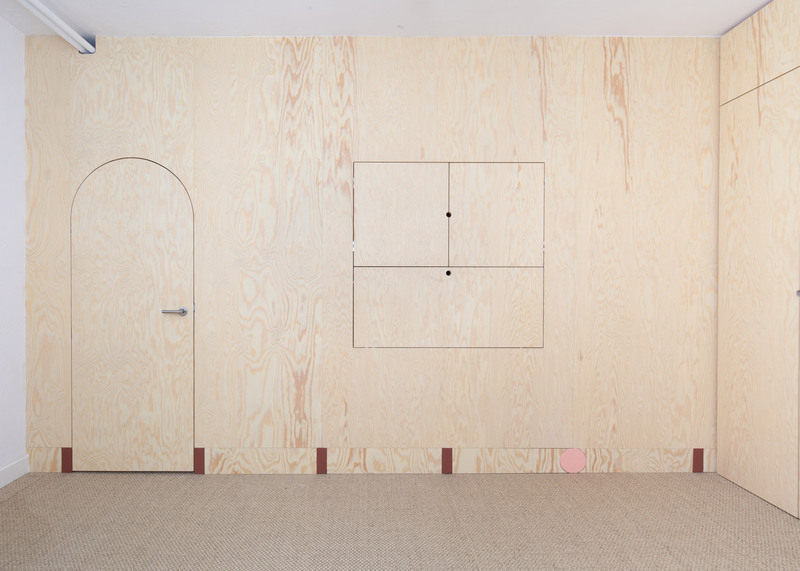 Kasisi – whose previous projects include a food cart for a suicide prevention organisation – also designed a set of pine plywood accessories for the newly-furnished home, including a podium for the playroom, storage boxes and side tables. 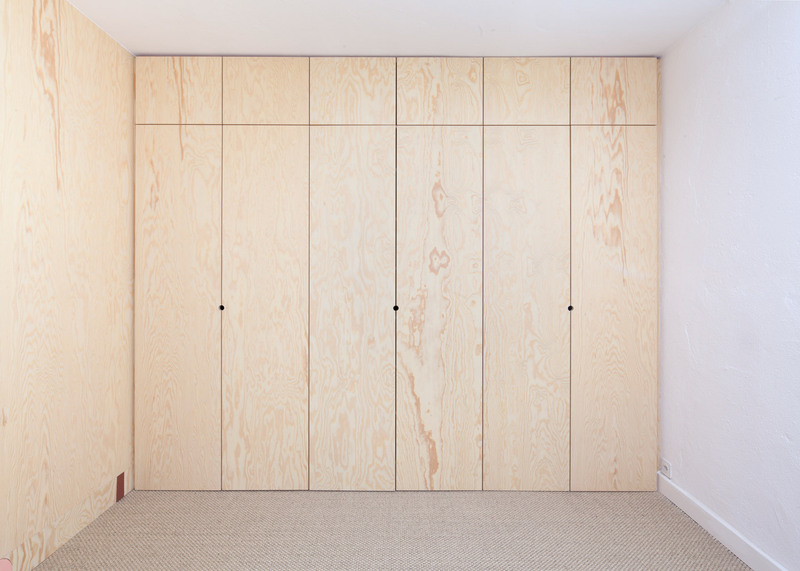 Wooden storage walls also feature within an artist studio in Moscow, and are used to contain spaces for cooking, washing, sleeping and storing inside a former nursery in Barcelona. Photography is by Yann Laubscher. Carpentry is by Fabien Pont.